Gen. 4 Alfred Byrne of Alderney, originally of Sleaty, 1846-1916. Alfred was the youngest son of Gerald and Eliza and was probably the only sibling left in Sleaty at the time of the post Famine period of 1850. His father had emigrated to the United States in 1852 but he tragically died there in 1858. Alfred was then 12 years old. 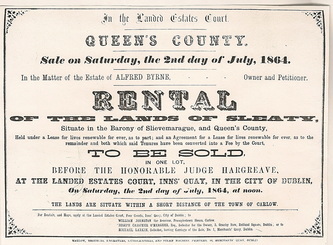 The Byrne estate at Sleaty along with many others was in dire economic hardship and was taken over by the Encumbered Estates court. Because the land would have normally gone to the eldest son, Alfred being under age was made a ward of the District Receiver of the Court of Chancery, William Johnston of Prumplestown House, Carlow, on 6th July 1861. This may have been to protect his interest In the estate. 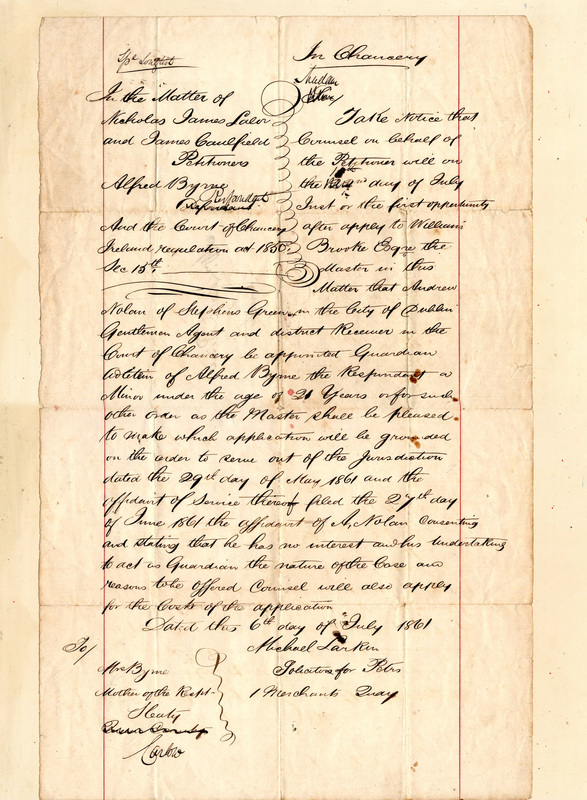 On February 1864, what remained of the estate, just the house, farm offices and 41 acres, was converted by the Court from a lease to fee-farm, (freehold). 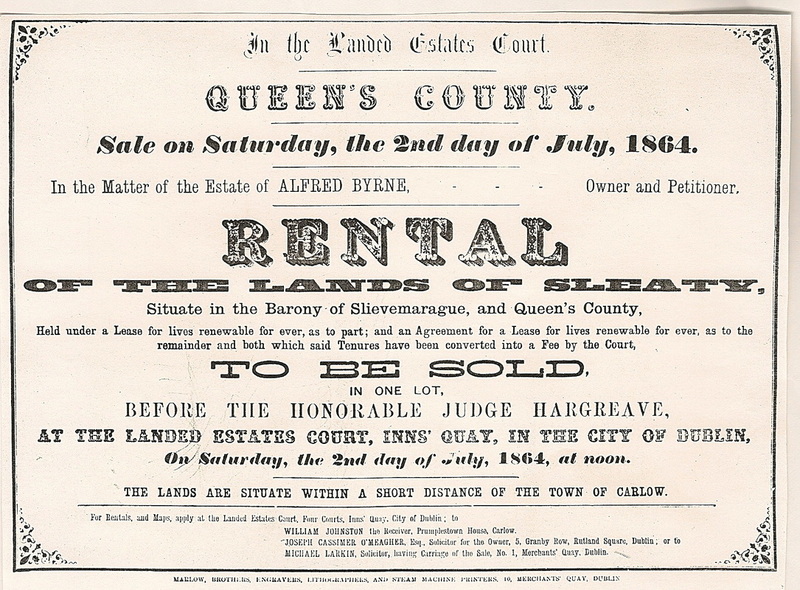 On Saturday 2nd July 1864, the lands of Sleety, described as being situate In the Barony of Slievemarague in the Queen's County, were auctioned and sold before the Hon. Judge Hargreave at the Landed Estates Court, Inns Quay, Dublin. Michael Larkin of Merchant' Quay, Dublin was solicitor for the sale. One right was left covenanted and reserved for the family and their descendants, that was the right to hunt, hawk, fish, and fowl without charge at Sleaty. Alfred and his brother, John, then left Sleaty with their mother to go to Kilmallock, Co Limerick where she took a position as Matron of the Poor Law Union Workhouse. At that time the 8th Regiment of Dragoons was garrisoned in Kilmallock and at the age of about 23 he enlisted In the Regiment. He is described as “a private soldier, viv. 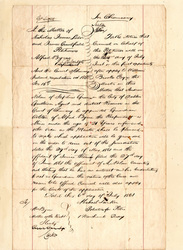 1875” In the Shearman genealogy. Alfred married Sarah about 1870, but little is known about her except that she came from Canada. The couple had a large family, three sons and five daughters He travelled all over the British Empire with the army and probably saw action in the 1st Boer War in South Africa. He gained promotion and retired as a Superintend Barrack Quartermaster Sergeant, Army Service Corps in Platte Saline, Alderney, Channel Islands. At the age of 60 he retired from the Army around 1900. He took the opportunity of his retirement in 1903 to visit his brother Charles in ClonmeL, the visit was recorded In a letter from his nephew Gerald Byrne of Clonmel to his son Cathal Byrne. There is a death certificate for an AIfred Byrne who died in Bermondsey ,London, in April 1916, at the age of seventy. He was described as a leather worker. However, it is not certain that this relates to Alfred of Sleaty. According to army records an Alfred J. Byrne died in 1916, aged 75. One of Alfred’s son, Francis Gerald Christopher, served in several British Army regiments, but he ended his career with a dishonourable discharge for various misdemeanours.